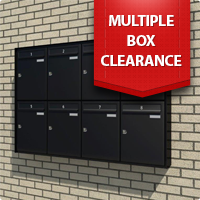 Blog › Clearance on a selection of our Multiple Letterbox Banks!!! Does your apartment use a multiple letterbox system...? Do you require NEW lockable banks, our Multiple Box CLEARANCE can help! Are you an apartment owner, rent an apartment, or perhaps you maintain student accommodation? A secure multiple letterbox bank is essential for all residents to collect their daily post. Whether you require an internal or external multiple letterbox system, we can supply them assembled ready for fitment. All our letterboxes are new and have never been used, they are NOT SECOND HAND, they have simply either been manufactured by error or returned to us for exchange...our prices also include delivery anywhere in the UK mainland. We currently have a CLEARANCE SALE, so please take the time to browse through our collection of multiple letterboxes for sale and order in a few simple steps online today. Our anthracite grey EXPRESS letterboxes featured are particularly popular, and can be supplied quickly, within 2-3 weeks if necessary. All our letterbox banks labelled "express" are NEW, Made in Germany and manufactured to the highest quality! We provide the widest range of letterboxes in the UK market, at fantastic prices, with a letterbox budget range available, for those with smaller budgets, who are still looking to receive a quality postal solution, from Europe's largest and leading manufacturer of letterboxes. To view our entire range of multiple letterbox banks available, simply select the link. If you would like our advice on the most suitable multiple letterbox system for your building, please enquire with our friendly team today, we shall be happy to advise. So don't waste time, take advantage of our Special Offers!! !